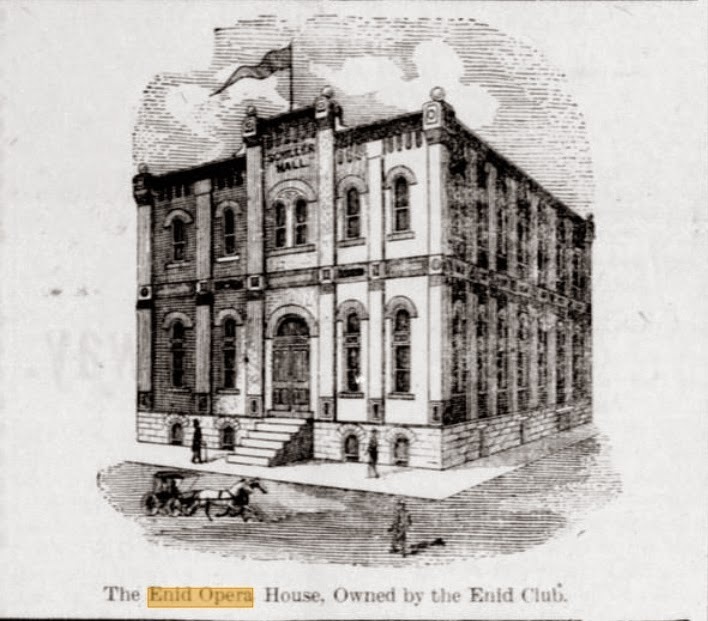 “Enid had no opera house, but along in the late nineties (1890’s), a scheme was broached to build “Schiller Hall”, now known as the old opera house, on the East Broadway. The money to build Schiller Hall was raised by selling shares, by subscription, by lottery, or any other old way. It was a hard pull, but at last success crowned the efforts, and Enid was ready to welcome theatrical troupes, opera singers, or any other old thing that offered amusement”. This was one of the original brick buildings finished 9/11/1899 pushed by Rick Messall , the young man who built the first business, The Enid Bottling Works, in Enid, O.T. after the Run in 1893. He donated the land and organized the fundraising. In October 1899, the basement was leased for a roller rink. The rink was called “Alhambra Skating Ring”. The original intent for the basement was a gymnasium for the Sons of Herman. From 1903 to 1907 the High School Meet upstairs. Five recitation rooms and an assembly room were provided in these quarters. The partitions swayed back and forth and the dust sifted in through the windows. Show troops practiced in the afternoons dividing the attention of the student body with their study and recitations. The play grounds were in the streets and the flag fights were held on the roof of an adjoining black-smith shop. The Enid Daily Eagle Vol. 10. No 60, Ed 1 Thursday May 25, 1911 (Article refers to a winding staircase in the building.) 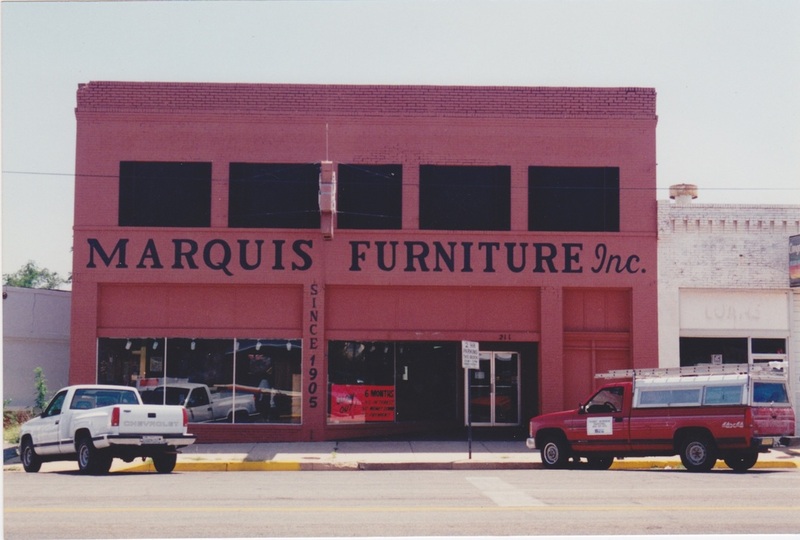 Marquis James went to High School in the building. In 1906 the “Opera House” was improved to seat 1600. It became the Stater Theatre. Vaudeville performed here. 1907 to 1912 Oklahoma National Guard Machine Gun Platoon was upstairs and the Armory in the basement. December 19, 1909 moving pictures of the Ed Adamson/Jim Downing Wrestling match were filmed here. March 5, 1911 Cherokee High School Beat Enid in a basketball game on the second floor. 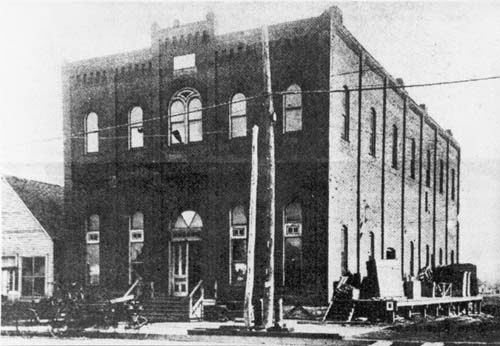 In 1915 Enid Transfer and Storage Co moved storage rooms and offices to Building. In 1920 George Emrick had auto machinery and implements in the basement.